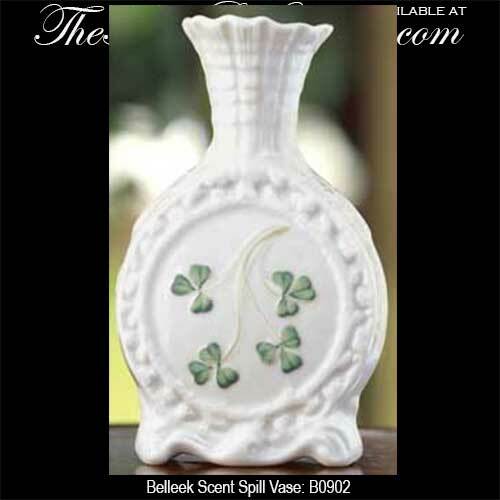 Belleek China scent spill vase features hand painted shamrocks. One of the earliest Belleek designs to appear in the "Old Photograph Album" without shamrocks, this piece was referred to as the enigmatic "Pilgrim Vase." Shamrocks were later added, at which time it was renamed the Shamrock Scent Spill. It remained in the Pottery Archives and was briefly brought back in the 1970s and then again retired. This Belleek vase features hand painted green shamrocks. The fine china Irish vase measures 4 1/2" tall and is handmade and hand painted in Belleek, Ireland. The Belleek scent spill vase has been reintroduced from the archives with a limited production of 2,000 pieces and it is gift boxed with a shamrock history card, complements of The Irish Gift House.